Expressive design with new Singleframe and features from the original Audi quattro. Generous, elegant interior, touch operated screens and high-tech navigation. 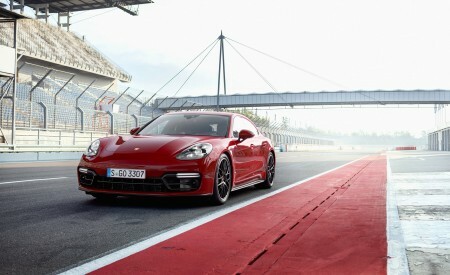 Available at launch as a six-cylinder 50 TDI with 286PS, capable of 62mph in 6.3 seconds and a 144mph top speed. S line specification includes HD Matrix LED lights, 21-inch alloy wheels and adaptive air suspension sport as standard. 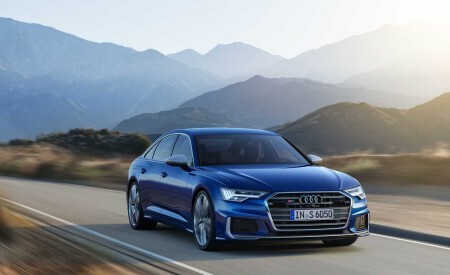 High-end Vorsprung edition due shortly after launch gains Valcona leather, dynamic all-wheel steering, 22-inch alloy wheels, head-up display and a full leather package as standard. 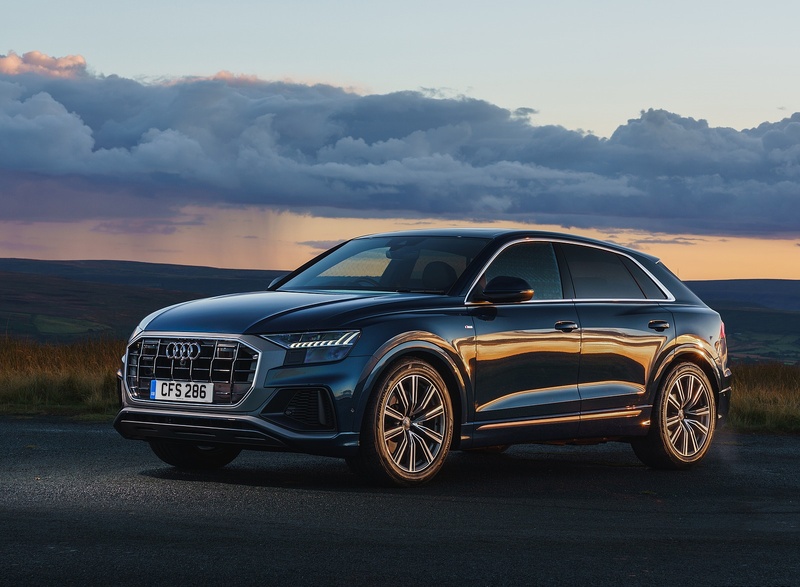 Prestige, presence and impeccable Audi quality in every detail: the all-new Q8 is ready to combine the best of both worlds by offering the elegance of a four-door luxury coupé and the convenient versatility of a large SUV. Remaining faithful to the dramatic styling of the original Q8 Sport concept first revealed at the 2017 Geneva Motor Show, the series production car will join UK roads this summer featuring a generously dimensioned interior with a variable luggage compartment, state-of-the-art drive and suspension technologies and intelligent assistance systems that make it a convincing companion for business and leisure. A strong yet efficient 3.0 TDI with a mild hybrid system provides the dynamics which are implied by the muscular exterior design. 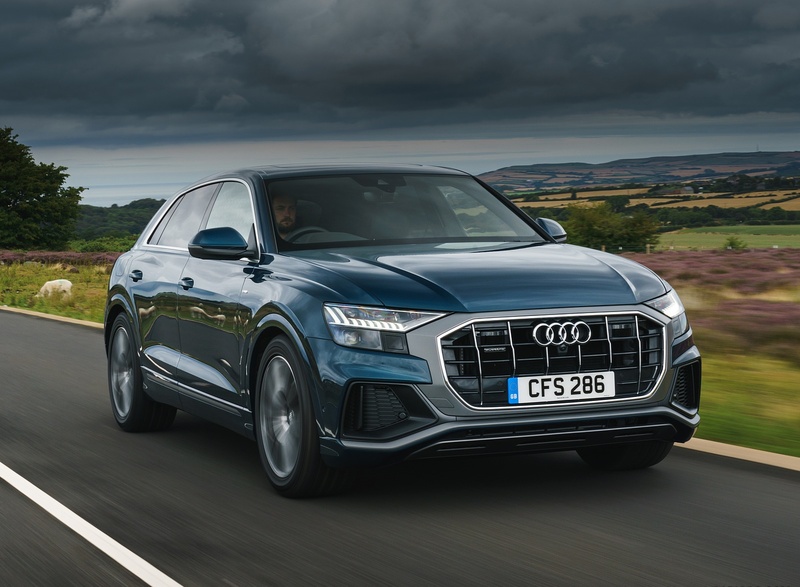 With the permanent quattro all-wheel drive and a ground clearance of up to 254 mm, the SUV coupé can continue when paved roads end. 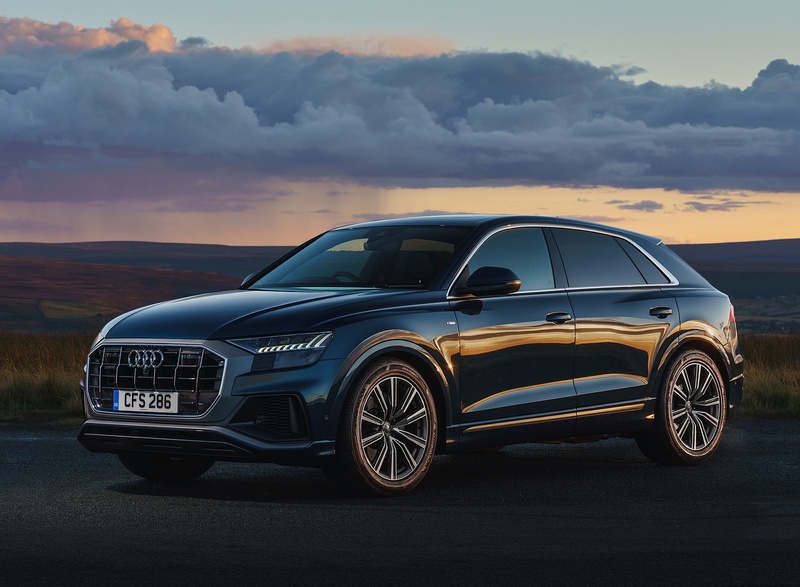 At 4,986 mm long, 1,995 mm wide and 1,705 mm high, the new Audi Q8 exudes a presence on the road like no other SUV from the brand with the four rings. With its coupé-style roof line it appears much lower than its Q7 sister model. It is 66 mm shorter, but has become 27 mm wider. The distinctive front end, the short rear overhang and the mighty 21-inch wheels with a diameter of 795 mm paint a picture of powerful dynamics. In the UK, S line specification that is equipped with a host of standard features ranging from sport-configured adaptive air suspension and MMI Navigation Plus with MMI Touch to HD Matrix LED headlights, will be available from market launch. Soon after, an even more comprehensively specified Vorsprung version will join the line-up. With a wheelbase of almost three metres, the Audi Q8 offers ample space for five people. The interior space exceeds that of the direct competitors in almost all relevant dimensions. With its large luggage compartment and generously sized storage compartments and tray areas, the Q8 is ideal for longer journeys. The luggage compartment of the SUV holds 605 litres as a standard, which increases to 1,755 litres with the rear backrests folded down. Two golf bags can easily fit in diagonally. The tailgate can be opened and closed electrically as standard. The electric luggage compartment cover is another convenience option. Guided on rails, it automatically retracts when the tailgate is opened and is extended again upon closing. 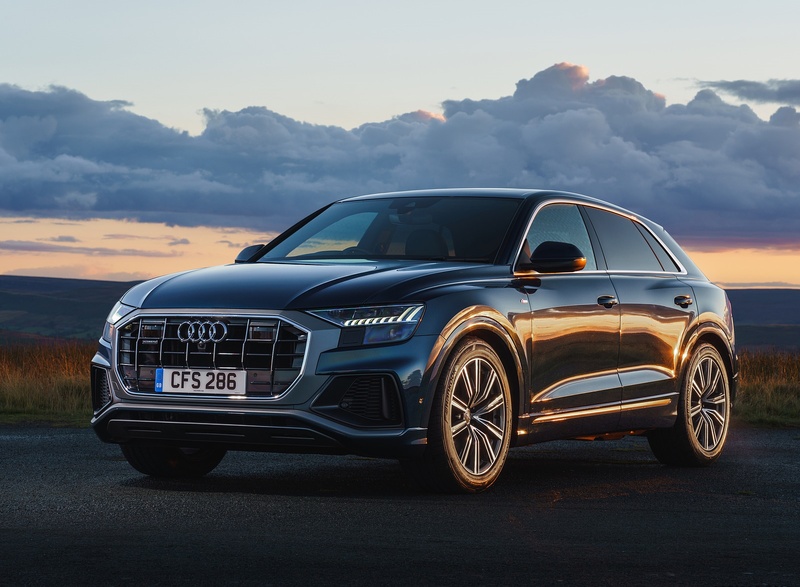 The Audi Q8 is a representative of the progressive design language that Audi first brought onto the road with the new A8. Strong contours and athletically tight surfaces convey a feeling of power, sophistication and the special dynamics of the permanent all-wheel drive. 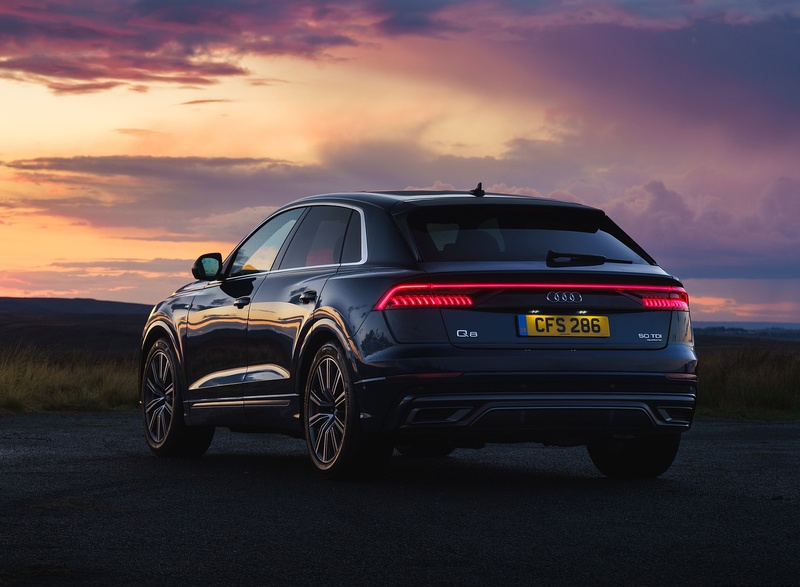 The Q8 interprets this in its very own way, as the fusion of an elegant four-door luxury coupé with a large SUV, and with echoes of an Audi icon – the original quattro. 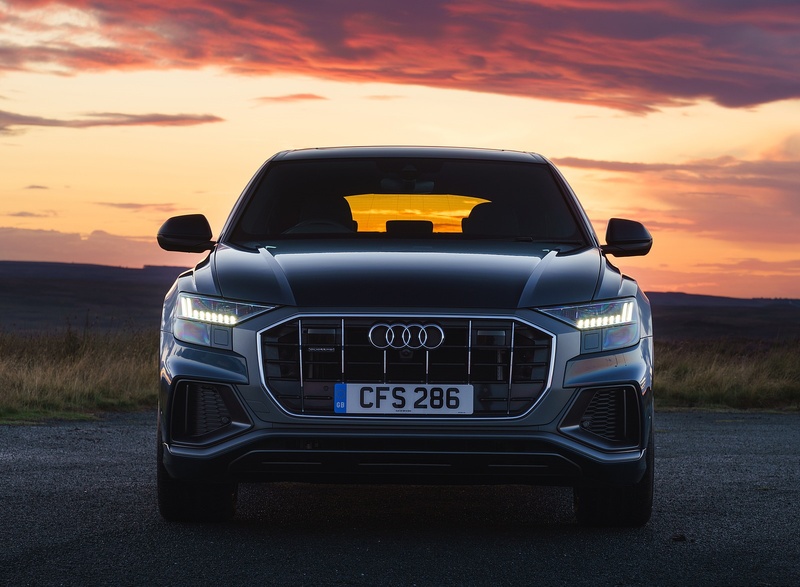 With the imposing Singleframe in octagonal design, the Audi Q8 debuts the new face of the Q family. Six distinctive vertical chrome fins make the radiator grille appear upright and solid. A wide mask connects the Singleframe to the distinctive headlights. The spoiler, which protrudes at the front, and the large, strongly contoured air intakes further highlight the aggressive look of the Q8. 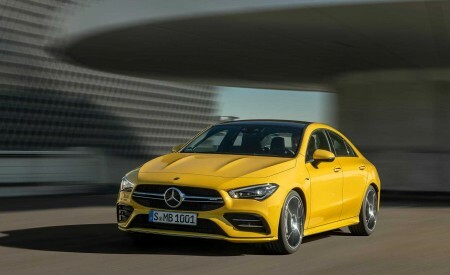 Thanks to the frameless doors, the coupé-type roof line stretches low across the vehicle body visually, ending in the a long roof spoiler. 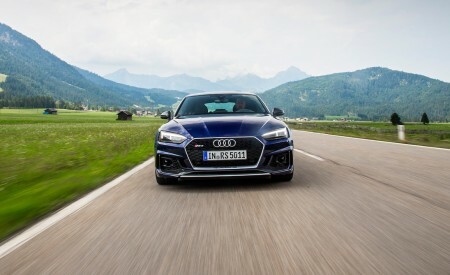 The roof line arches slightly towards the flat sloping, strong D-pillars, which are supported by wide, muscular contours – the quattro blisters, reminiscent of the original Audi quattro. The shoulder line stretches the SUV, elegantly connecting the powerful wheel housings. Compact proportions, paired with a very low roof and a flat window form the rear end. A narrow, black high-gloss element with an integrated light strip extends between the rear lights. This is a feature of top Audi models, accentuating the width of the Q8. It creates an independent light signature day or night, just like on the original quattro back in the day. The distinctive rear diffuser has four vertical fins and an integrated tailpipe trim on each side. For the headlights, Q8 customers can enjoy the benefits of HD matrix LED headlights fitted as standard, not only featuring the dynamic turn signal front and rear, but also an impressive light show during locking and unlocking. In future, Q8 owners can use the myAudi app on their smartphone to activate various lighting functions and experience them from the outside – a unique feature in the competitive field. Each headlight unit consists of 24 individual LEDs and, from afar, the two-part lights appear very flat, as only their top part is visible. 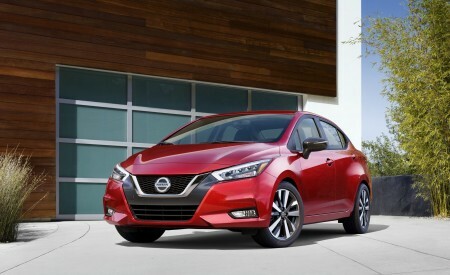 They integrate the daytime running light and the low beam, among other functions. The high beam is positioned underneath, darkened and offset to the back. The daytime running light signature with digital character comes in a strongly three-dimensional design for the first time. It consists of seven short segments and two longer ones at the edge of the headlight. The latter shift the visual focus to the outside, highlighting the width of the Audi Q8. The taillight uses a similarly three-dimensional design with its twelve segments – connected by the distinctive light strip which simulates depth. The upper MMI touch response display is the central element of the interior of the Audi Q8. With its black-panel look, it almost dissolves into a large, black surface when switched off. Simple, easy-to-understand symbols stand for the digital precision from Audi and for the high level of integration of the architecture and operation – simplicity replaces complexity. All fundamental lines originate from the large display, for example the continuous air vent strip with integrated chrome fins and an elegant aluminium-look strip. The slender dashboard and the calm lines with a strong horizontal focus highlight the impression of width conveyed by the interior of the Audi Q8. The styling in the interior is deliberately clean and simple. All elements have a logical connection and harmonise with one another: from the “wrap around” – the large arch running from the front doors across the instrument panel – to the operating unit for the light, which is finished in a black-panel look with a touch surface. All this combined gives the interior a feeling of calm. Designed as an independent geometric body, the console of the centre tunnel with its generous area visualises the robust character of the SUV. In the dark, the contour light traces the distinctive design lines of the interior and provides backlight for the three-dimensionally lasered quattro badge above the glove compartment – an example for the love of detail at Audi. The paint range for the Audi Q8 offers twelve colours which underline the striking design, including the latest colours dragon orange and galaxy blue. A full-body paint finish extending to the wheel arches is standard. On S line models, matt grey elements further increasing the effect of the Singleframe, the blade, the sill trim and the diffuser insert. These elements are finished in titanium black for the Vorsprung edition. For the interior of the Audi Q8, customers can choose from several colours and configurations. In S line configuration, the front sport seats with integrated head restraints, an S logo and rhombus pattern are upholstered in leather/alcantara, with the option of Valcona leather available to order separately. Inlays in aluminium are fitted as standard for a distinctive interior contrast. Vorsprung specification gains contoured Super Sport seats upholstered in Valcona leather as standard, with massaging and ventilation functions optionally available. 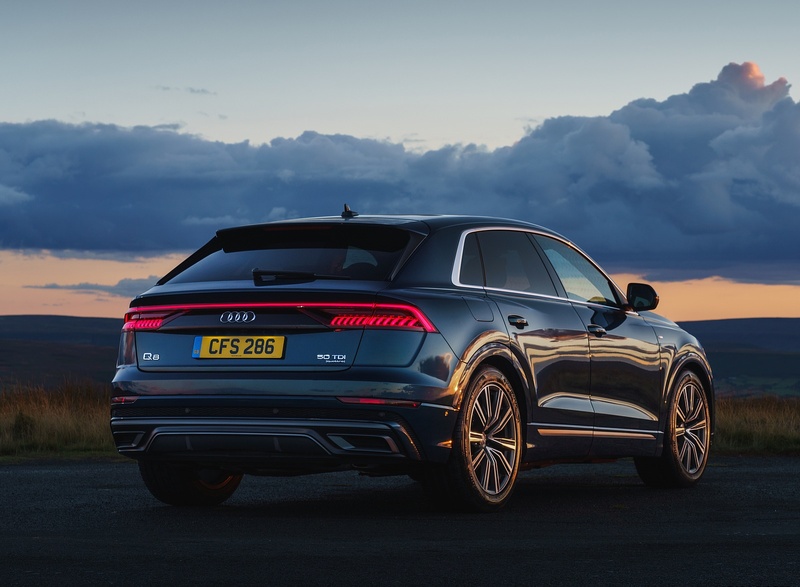 With its high level of stiffness, the body of the Audi Q8 provides the foundation for top workmanship, is excellent for background noise and has precise, assured handling. 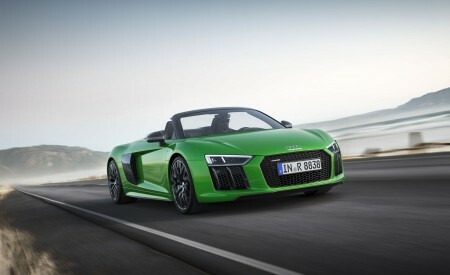 Designed with the Audi Space Frame concept, it contains numerous lightweight aluminum and hot-formed steel components. The latter form the ultra-high strength backbone of the passenger compartment – their content in the body-in-white is 14.4 percent. Cast aluminium parts make up 15 percent, as for example the suspension strut towers in the engine compartment and the connecting parts between sills and longitudinal members. The side panel as well as large areas of the floor, the rear wheel housings and the roof consist of aluminium plates, just like the frameless doors, the front wings and the tailgate. They make up 23.7 percent of the body-in-white. 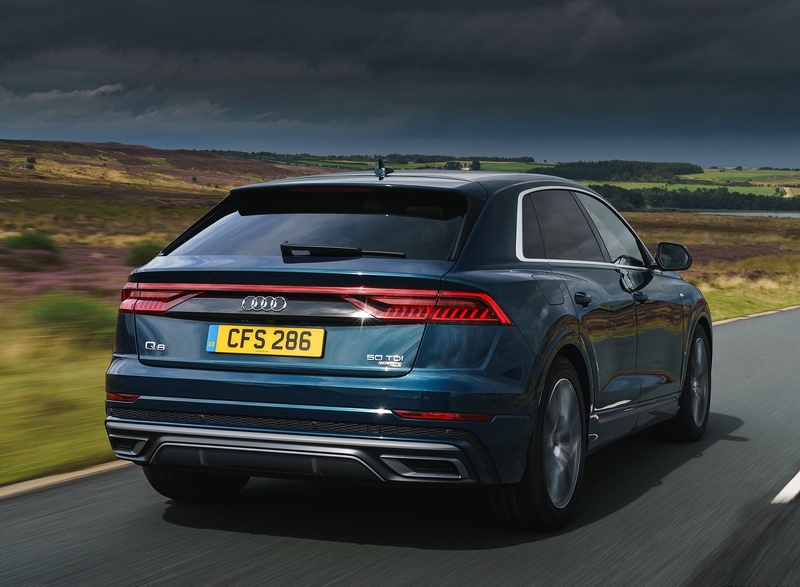 With a 3.0 TDI under the bonnet, the kerb weight of the Audi Q8 is 2,145 kilograms – including the complex MHEV technology with lithium-ion battery. The frontal area of 2.84 m2 and a cd value of 0.34 ensure relatively low drag. The interior exudes a feeling of serenity, thanks to the complex sound insulation and the sophisticated aerodynamics. A double-layer windscreen is standard. Audi is quattro and quattro is Audi – this of course applies in particular to the Q8, the top SUV of the brand. The purely mechanical centre differential transfers the forces to the front axle and rear axle at a ratio of 40:60 as standard. When required, it transfers the majority to the axle with the better traction. The suspension makes a crucial contribution to the precise handling. The five-link front and rear suspensions are made largely of aluminium. The transmission ratio of the standard progressive steering becomes increasingly direct as the steering angle increases. In S line specification, the Q8 has 21-inch alloy wheels. Wheels with size 285/40 R22 are fitted to the top-of-the-range Vorsprung model. Six-piston brakes with fixed aluminium calipers are fitted to the front axle. Adaptive air suspension with controlled damping is an standard feature, with a sport setup. It can be adjusted to four modes with the Audi drive select dynamic handling system, varying the ride height of the body by up to 90 mm. High ride comfort and agile handling – the adaptive air suspension brings both together. 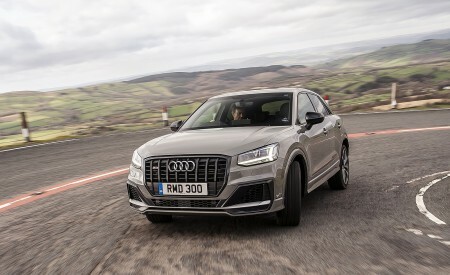 A dynamic option in the Audi Q8 (fitted as standard in Vorsprung specification) is the all-wheel steering which can turn the rear wheels by up to 5 degrees. At slow speed, they steer in the opposite direction to the front wheels, reducing the turning circle of the SUV by a good metre and further increasing its agility. At high speed, they steer in the same direction as the front axle, supporting stability during lane changes. The management for the adjustable suspension system is integrated into the control unit for the electronic chassis platform. The system is closely interlinked and work in a highly coordinated manner with maximum precision. Audi drive select allows seven different driving profiles to be selected, including the off-road mode. 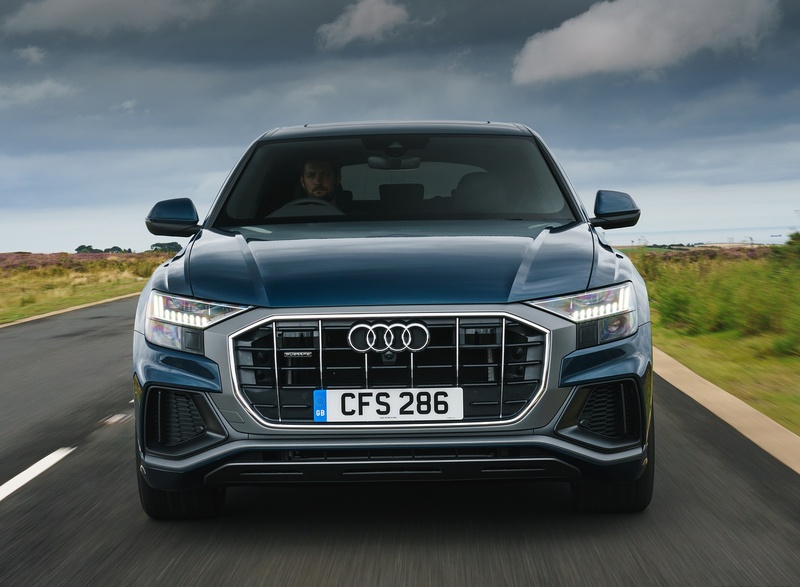 Off-road, the Audi Q8 benefits from the standard quattro drive, the short overhangs and the large ground clearance – a maximum of 254 mm with the adaptive air suspension. The electronic chassis platform captures the tilt angle of the car and displays this information for the driver on the MMI. On steep slopes over 6 percent, the hill descent control provides support with automatic braking input. The system keeps the speed set by the driver at a constant level up to a maximum of 18mph, allowing the driver to fully focus on the terrain. 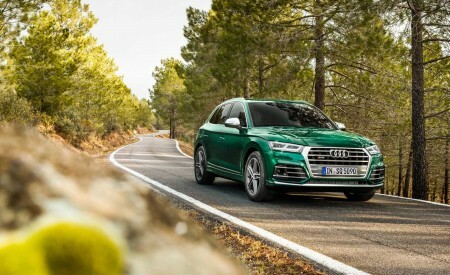 The drive system in the Audi Q8 is strong and highly efficient at the same time, thanks to the new mild hybrid technology (MHEV). It integrates a lithium-ion battery and a belt alternator starter (BAS) into a 48-volt primary electrical system. The rechargeable battery is located underneath the luggage compartment floor and stores 10 Ah of electrical capacity. The dynamic SUV can coast between 34 and 99mph with the engine switched off, then the BAS restarts the engine quickly and very comfortably. During deceleration, the BAS can recover up to 12 kW of energy. The start-stop range starts as low as 13mph. In customer operation, the technology package reduces fuel consumption by up to 0.7 liters per 100 km. 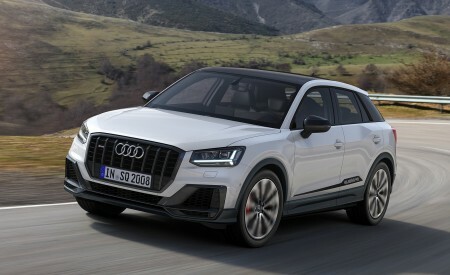 At launch, the Audi Q8 is fitted with a 3.0 TDI (Q8 50 TDI). 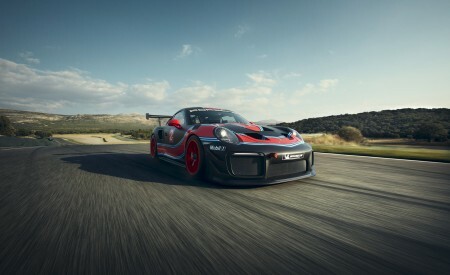 It generates 286PS and delivers 600Nm (442.5 lb-ft) of torque to the crankshaft. It accelerates the large SUV from 0 to 62mph in 6.3 seconds on its way to a top speed of 144mph. The 50 TDI offers sophisticated solutions for many technologies. The crankcase and the cylinder heads have separate coolant circuits so the ideal temperature level can be set for any driving situation. Cast-in channels cool the pistons with oil. Their rings and the wrist pins are designed for minimum friction, while the oil pump is fully variable. Switchable hydraulic bearings connect the engine to the subframe of the front axle. In idling, they eliminate vibrations with soft characteristic curves while during driving they suppress vibrations from the power unit with higher damping – allowing the powerful TDI to always provide a highly refined ride. 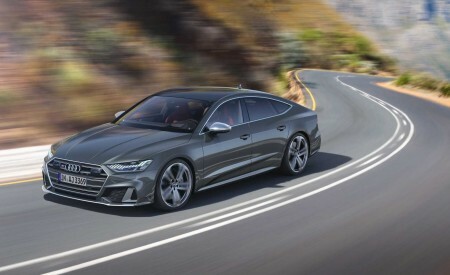 A smaller three-litre diesel with 231PS (Q8 45 TDI) and a 3.0 TFSI petrol-engine car with 340PS (Q8 55 TFSI) will follow early next year. The transmission of forces is provided by an eight-stage tiptronic with fast and soft gear changes. A torsional vibration damper, which acts based on engine speed, mostly compensates the engine vibrations to allow efficient driving even at very low revs. Special ventilation allows off-road use. With its electric oil pump, the tiptronic can engage the gear required for restarting while coasting with the engine switched off. The operating concept in the Audi Q8 needs almost no buttons or knobs. It focuses on two high-resolution touch displays. This allows the brand to demonstrate how it transfers its uncompromising quality claim to the digital world. The upper display with 10.1 inch screen diagonal is used for controlling the infotainment and the navigation system. The lower 8.6 inch display allows the driver to manage the heating, ventilation and air conditioning as well as comfort functions and text input. The driver’s wrist can rest comfortably on the tiptronic selector lever during operation. The MMI touch response concept allows fast and reliable operation. A confirmation click can be felt and heard when a function is selected with a finger tap. The menu structure is intuitively logical and flat like on a smartphone, including freely configurable favourites and start screens. In addition to all this, the natural language voice control turns the Audi Q8 into an intelligent dialogue partner. The system processes all questions and commands in two ways – with information stored onboard and with detailed knowledge from the cloud. Drivers can word their commands freely. The voice control can, for example, understand the sentence “I am hungry” and accordingly offer suggestions for restaurants close by. MMI navigation plus with MMI Touch also includes the Audi virtual cockpit as standard. Its high-resolution 12.3 inch display can be switched between two views – classic and navigation – with the multi-function steering wheel. After market launch, the Audi virtual cockpit plus will offer a third interface with a particularly focused look. The head-up display, a standard feature for Vorsprung models, projects important information onto the windscreen, including detailed lane guidance for navigation. 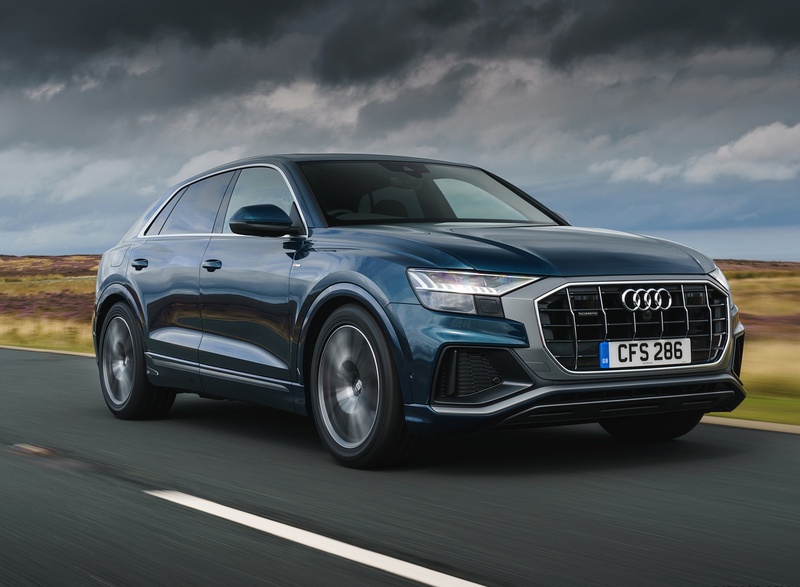 As standard, the Audi Q8 is equipped with MMI navigation plus, which uses the new LTE Advanced standard for data transfer. The navigation system offers intelligent destination suggestions based on previous journeys. It also draws on the system’s experience of driving times and traffic loads. The route is calculated online on the servers of the map and navigation provider HERE, using real-time data for the overall traffic situation. 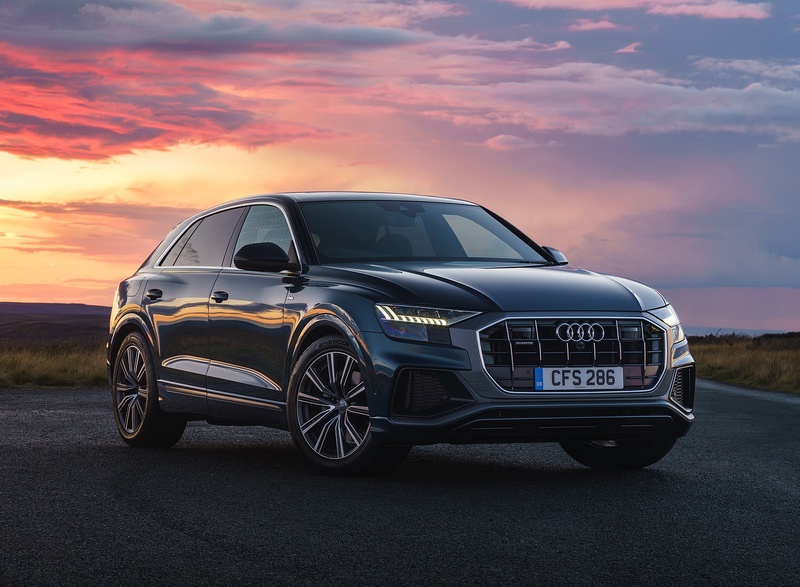 When it comes to operation and to sound and connection quality, the telephone system in the Audi Q8 is of the highest standard, thanks to the Audi phone box and voice-over LTE. The same applies to the sound systems from Bang & Olufsen. The top version with 23 speakers delivers the 3D sound with its treble information to the front seats as well as to the rear. The music unfolds exactly how it was recorded at the concert hall – an extraordinary listening experience. 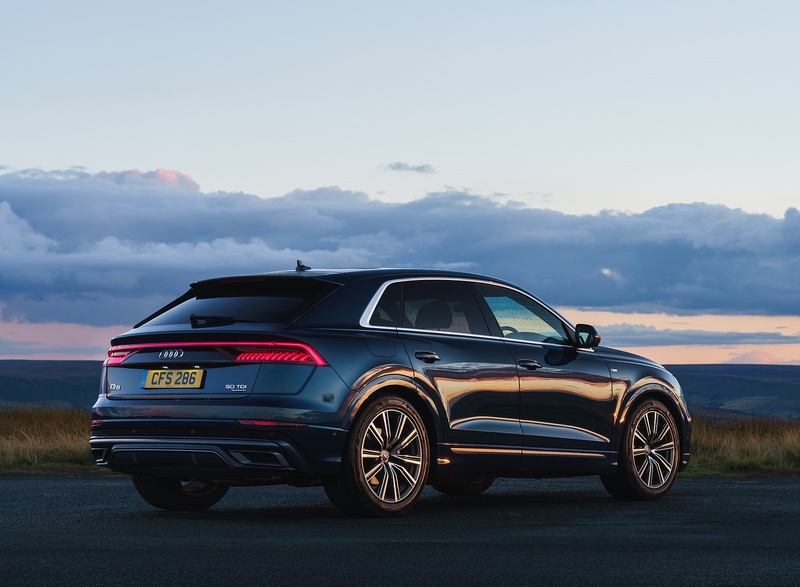 Whether parking, in the city or on long journeys – the Audi Q8 makes life easier for its driver in many situations. Audi bundles the assistance systems into a total of four packages. The highlight in the Tour assist package is adaptive cruise assist, which comfortably provides longitudinal and lateral control in all speed ranges. It supports the driver with accelerating, braking, maintaining speed, keeping distance and in traffic jam situations. The system detects lane markings, roadside structures, vehicles in adjacent lanes and vehicles driving ahead. 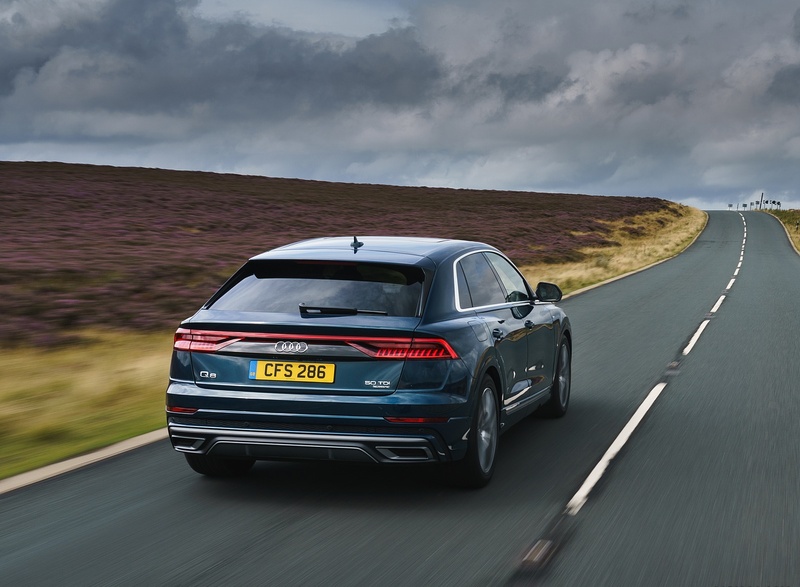 An advantage in tight traffic: the Audi Q8 automatically adapts its speed to the traffic situation, taking into account the speed limit. The efficiency assist is another component of the Tour package. It automatically adjusts to the current speed limit, reduces the speed before corners, during turning and on roundabouts. In addition to the predictive information in the Audi virtual cockpit, the active accelerator pedal also provides haptic feedback. Both together support economical driving. This results from the use of the MHEV recuperation and the intelligent selection of coasting or thrust, depending on the events ahead. Emergency assist is a safety-relevant system in the package. It detects within system limits whether the driver is inactive and accordingly provides a visual, acoustic and haptic warning. 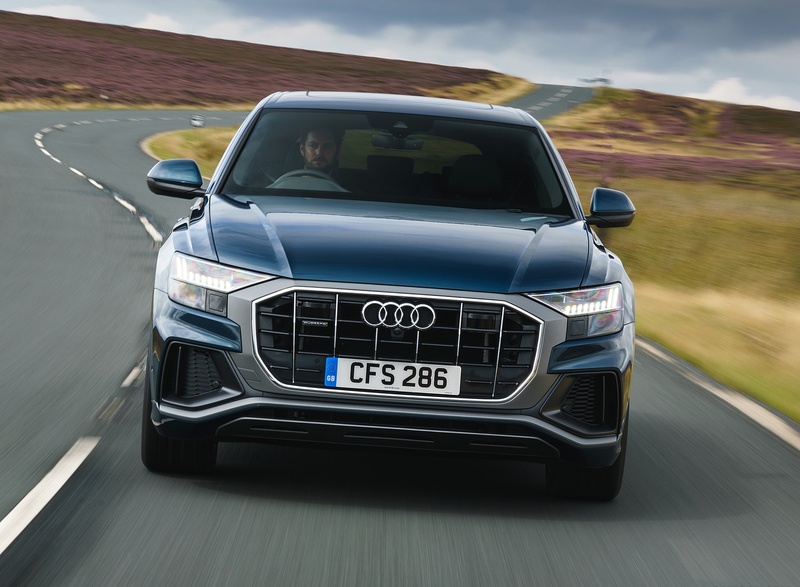 If this does not prompt a reaction, the system takes control of the Audi Q8 and automatically stops it in its own lane. 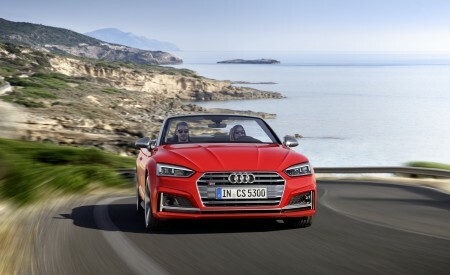 This also activates the safety measures of Audi pre sense and triggers an automatic emergency call. Five systems provide safety in city traffic. Crossing assist detects critical traffic crossing in front of the car, Audi pre sense 360° warns against vehicles approaching from the side, and rear cross traffic assist registers approaching vehicles during slow reversing, for example when coming out of a perpendicular parking space. Exit warning and lane change warning complete the package. The systems in the Park plus assist package, which will be added to the range later on, support the driver during maneuvering. Manoeuvring assist counteracts imminent collisions with small steering impulses and independent braking to a standstill, for example when detecting pillars in a multi-story car park. Kerb warning protects against damaging the rims during parking. Several images from the surround cameras allow precise manoeuvring down to a centimetre and provide a view of crossing traffic and a detailed view of the wheels. The 3D view with freely selectable perspective is the highlight. The package also includes the (remote) parking pilot, which independently steers the SUV into and out of a parking space while monitored by the driver. The driver can get out of the car beforehand and trigger the process using the myAudi app on their smartphone. The remote garage pilot offers a similar level of convenience. Thanks to the laser scanner, it can move very close to walls and other obstacles such as bicycles in a garage. It forms part of the plus assist package, which combines all three packages. If the Q8 is used for towing, trailer assist provides support by automatically steering the duo when reversing. The driver conveniently sets the direction on the MMI touch display. The camera image shows the current and the desired reversing angle. Audi also supplies park assist separately. This steers the Q8 independently into parallel parking and bay parking spaces – forwards or backwards. The driver only has to accelerate, select the gear and brake. Night vision assist improves situations with difficult visibility during darkness by highlighting detected persons and larger animals in yellow in the Audi virtual cockpit. 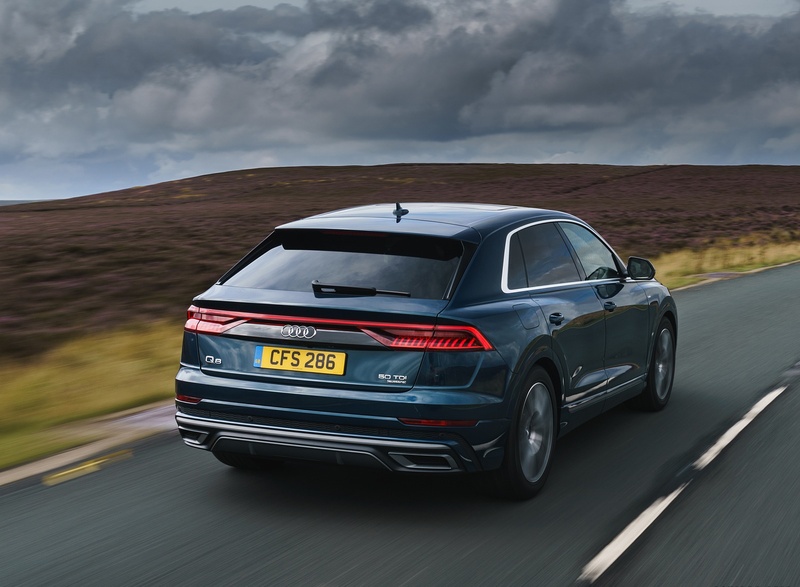 A high-tech component from Audi is behind all these features: the central driver assistance controller – standard for the Q8 – permanently calculates a differentiated image of the environment. The required data is obtained – depending on the selected options – from up to five radar sensors, five cameras, twelve ultrasound sensors and the laser scanner. It uses these to calculate the signals for the actuating elements to provide best possible driver assistance. The Audi Q8, which is manufactured at the Bratislava plant, will be launched in the UK in summer 2018.